The West Seattle Transportation Coalition (http://www.westseattletc.org) in October 2013 issued a call to action from the offices of Washington State Governor Jay Inslee, King County Executive Dow Constantine, then Mayor Mike McGinn and then Mayoral candidate Ed Murray, and City Councilmember Tom Rasmussen. West Seattle, unique to all other regions of King County, faces up to 27% transit cuts due to the current funding crisis in Olympia that special sessions of the State Legislature were unable to overcome. The rest of King County faces only 17% cuts. In addition, West Seattle faces the impending removal of the SR-99 Viaduct, our main avenue to reach downtown Seattle. With the Seattle deep bore tunnel drilling project increasingly behind schedule with the discovery of steel pipes left behind a decade ago from a previous WSDOT project, our situation has grown even more complicated. Our circumstances and geography leave us with few obvious mitigation options as a community around these problems. On January 14th, 2014 at 6:30pm, we will host a Q&A Panel with various levels of government in response to these issues, and to see what can be done, in a live event. Charles Knutson, Senior Policy Advisor to Washington State Governor Jay Inslee. Chris Arkills, Transportation Policy Advisor to King County Executive Dow Constantine. Andrew Glass Hastings, Transit and Transportation Advisor to Seattle Mayor Ed Murray. Tom Rasmussen, Seattle City Councilmember and Chair of the City’s Transportation Committee. The event will be held at the Youngstown Cultural Arts Center, 4408 Delridge Way SW, in West Seattle, in the Thelma Dewitty Theater. The event will run from 6:30pm to 9:00pm. The West Seattle Transportation Coalition has provided to each attendee a list of 7 to 10 questions, and will be following up with each for full answers, for publication after the event. The West Seattle Transportation Coalition will cover 3-5 questions with each attendee on January 14th, as time permits. On January 14th, 2014 at 6:30pm, the West Seattle Transportation Coalition (WSTC) will be hosting a Q&A Panel with the offices of State of Washington Governor Jay Inslee, King County Executive Dow Constantine, Seattle Mayor Ed Murray, and Seattle City Councilmember Tom Rasmussen, who chairs the City Council’s Transportation Committee. This will be a panel Q&A with the WSTC moderators asking questions of each level of government about our transportation issues. This will be relevant to everyone living in Seattle’s District 1, as well as our neighbors in District 2, District 7, White Center, Seacrest, and North Highline. Please plan to attend. The event will be at Youngstown Cultural Arts Center, 4408 Delridge Way SW, Seattle, WA 98106. For the Facebook event page, please click here. The West Seattle Transportation Coalition needs to hear from you! Are you unhappy with our current transportation system, situation, and options? Come tell us what you’re upset about, and learn about the WSTC, our mission, and what we’re doing. What you come and tell us at this Listening Tour will directly affect how we interact with and pursue issues with the City of Seattle, King County, Washington State, and the Federal government. “We’d like you to tell us what works and what doesn’t work about transportation in West Seattle; what do you think can be improved, or what do you think is needed,” said WSTC Outreach Chairperson Deb Barker. WSTC formed September 24, 2013 by unanimous consent of 40+ community leaders. Groups and people grant us their permission to speak on their behalf for transportation issues. Positions, issues, etc. all derive from those endorsers in aggregate – the WSTC is an executor. WSTC covers the “big stuff”, peninsula wide or multi-neighborhood transportation issues. Board and it’s officers work on and with committees to get results to those issues. 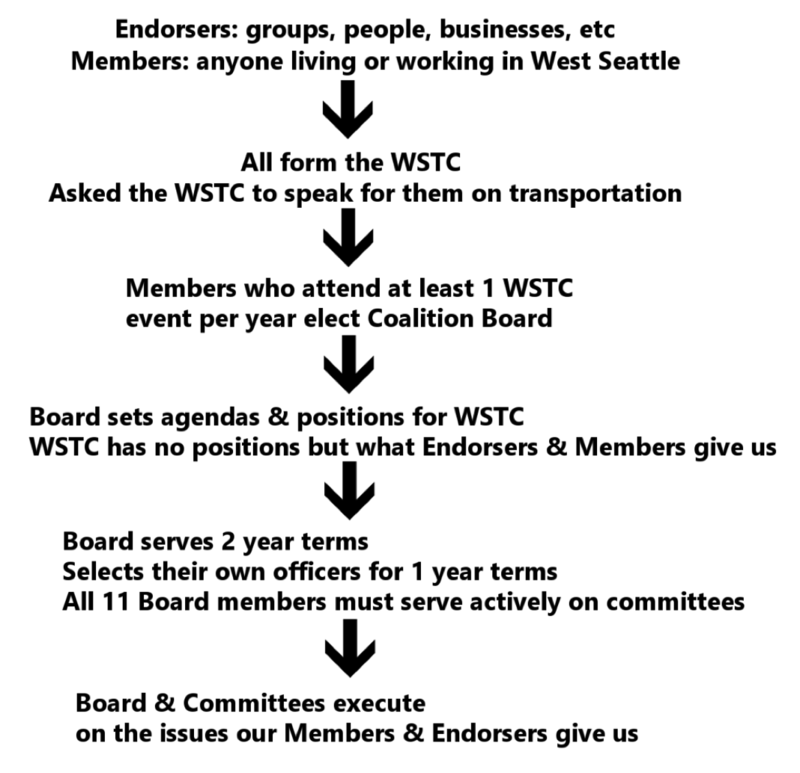 Starting in the December 10th, 2013 meeting, any Member–who lives in, works in, or serves on an organization in our boundaries (all of West Seattle, South Park, Seattle’s new District 1, White Center, North Highline (the county, south to Burien, west of the Duwamish River)–can run for a place on our board or vote in Board elections if they’ve come to at least one general meeting of the WSTC. Terms are two years. Officer terms are one year. There are 11 board seats/positions. All 11 positions are up for election in May 2014. Each board seat is numbered, and future elections will be in odd/even numbered years in May of every year. Positions #1, #3, #5, #7, #9, and #11 would be up for election in 2015, 2017, and 2019. Positions #2, #4, #6, #8, and #10 will be up for election in 2016, 2018, and 2020. You must declare in-person, in our December 10th, February, or March meetings. You need to announce which position you want. By March 15th you must provide a photo and written statement up to 500 words, both for our website. Normally January would be available for this, but our January 2014 meeting will instead be our special transportation event with guests. Elections are in May 2014’s general meeting, by secret ballots. To vote, you must be a member and must have “signed in” at at least one general meeting/major event in the preceding year before that May. For the May 2014 elections, this means the October 2013 meeting, November 2013, December 2013, January 2014, February 2014, March 2014, or April 2014. Our current Interim Board serves until June 1st, 2014. The new incoming permanent Coalition Board takes over June 1st, 2014. Between May 2014’s election and June’s general meeting, the new Board will elect it’s officers by secret ballot. All Board members must serve actively on at least one committee (but does not need to chair a committee). If you are interested in joining the West Seattle Transportation Coalition as a regular volunteer, you can check our volunteer page here. If you are interested in serving on the WSTC Board, please review the by-laws, and we hope to see you in a general meeting (here is our general meeting schedule) by March 2014 so that you can declare! Remember that our January 2014 general meeting has a completely full agenda with a special event, so you have until February 2014 or March 2014’s meeting to decide. West Seattle appears to support Light Rail! 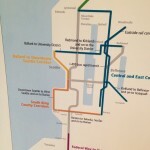 Areas under review by Sound Transit for Light Rail. There seems to be a strong hunger in West Seattle for Light Rail expansion to, and through, West Seattle. 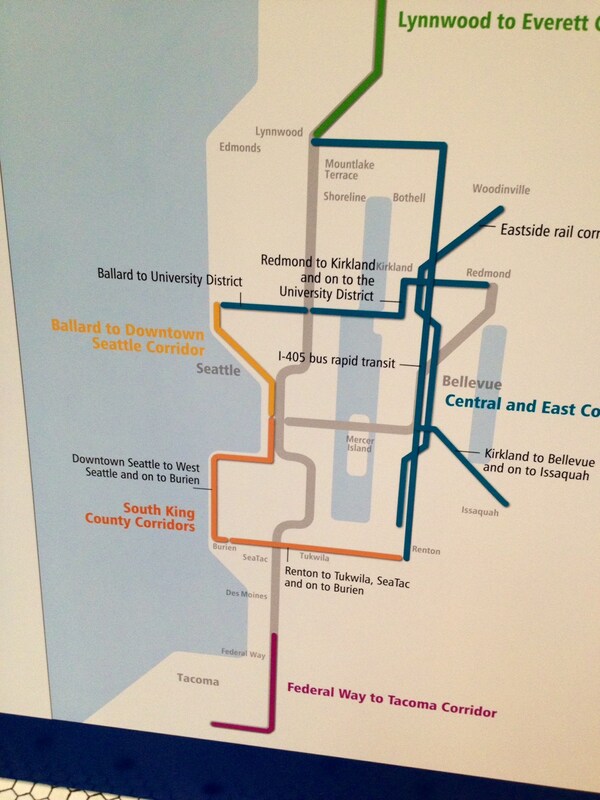 On November 21, members of the West Seattle Transportation Coalition attended an information hearing held by Sound Transit about the revision process for their long-range plan. Prior to this, virtually all the feedback we have heard either through the WSTC or through our various West Seattle community groups was overwhelmingly in support of and in favor of expanding Light Rail to West Seattle. At least one community group which has endorsed the WSTC (Westwood/Roxhill/Arbor Heights Community Council) had conducted a Facebook survey of their membership to see if they favored Light Rail. The public results as of November 26 are 24-0-1 in favor of Light Rail to West Seattle (using a Yes-No-Maybe format). That is for one sample a 96% approval rate. While at the event, Sound Transit spokespeople told the WSTC that of all the West Seattle resident responses they have received in their survey that ended on November 25, the approval rate was at 94% as of November 21.